← Crowdfunding – The New Way to Fund Book Deals? Does Your Online Presence Pass the Truth Test? What’s the fastest-growing marketing trend on the Internet? 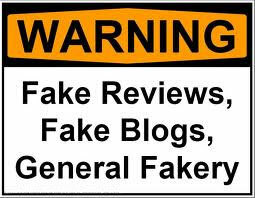 I’m sad to say it’s the “fakeosphere.” Yes, fake blogs (called “flogs”), fake web news sites and fake testimonials. They look like the real thing, right down to comments posted by “bloggers” and their supposed readers. Those comments appear to be written by people discussing the pros and cons of a particular product or service, and they even include some naysayers. “But in the end, the bloggers and their readers always win over the skeptics and persuade them to buy the product from a convenient nearby link,” writes Bob Sullivan in his blog on msnbc.com. He cites Internet marketing analyst Jay Weintraub, who believes the fakeosphere has become a $500 million-a-year industry. These fake sites and phony conversations are often more than simply misleading – OK, fraudulent – marketing. For consumers, they can be downright dangerous. Consumers are – and should be – increasingly wary. They’re scrutinizing websites more closely, especially if they’re considering making a purchase there. They’re avoiding social media interactions with anything that smells less than genuine, and they’re more careful about who they share information with online. What would they say about your online presence? Do you look like the real deal, or a potential cyber threat? Here are some ways to ensure you pass the reality test — and some missteps that will ensure you don’t. Fake people generate mostly sales copy – “Buy my product! It’s great!” They don’t engage in conversation, they don’t appear to have a personality – or friends or loved ones or hobbies, for that matter. Real people have text that informs and entertains users while offering them helpful information. The copy is professionally written – no typos or other mistakes – and provides answers to anticipated questions. It’s easy to learn more about you or your business and to find your contact information. Testimonials are from real people whose existence can be verified through a simple Internet search. They write blogs that are updated regularly and/or post articles with helpful information. Fake people have websites with lots of pop-up advertising banners and text urging users to “Buy my product!” Testimonials are from untraceable people with vague titles or credentials. The site may be hard to navigate; contact information may be missing or difficult to find; and there’s no link to media about the person or company. Real people share valuable information in their newsletters (which can be as minimal as a “tip of the week” email). Their newsletter (or tip) includes no overpowering sales pitch or self-promotion – or, at least, includes that only occasionally. It conveys a personality, whether warm and friendly, authoritative, or humorous. Fake people blast newsletters and promotional emails that may identify a problem but offer as the only solution hiring them or buying their product. They may seem unprofessionally written (errors, etc.) and lack personality. They offer nothing of value to the reader. All of these things will help you create an online personality that conveys your authenticity. But the No. 1 thing you can do – what I value above everything else – is to be, actually … genuine. In my book, “Celebritize Yourself,” I write about identifying the passion that led you to start your business, create your product or write your book. Maybe you became a financial adviser because you found it gratifying to solve people’s money problems. Or you developed a product that you know will benefit others. Or you have expertise that can help people live longer, happier, or more productive lives. Whatever it is that got you going, that’s what makes you genuine. Identify it and make it a part of your message, and no one will ever call you a fake. This entry was posted in author tools, blogs & writers, Columns, open publishing and tagged fake blogs, fake websites, flogs, Marsha Friedman, online presence. Bookmark the permalink. It’s so true that maintaining a real presence online is so important. You have to make an effort in creating a space online that does not look fake, and even then people are sometimes skeptical. If you are promoting a book and it’s a book that’s heavy on comedy, the characters are just total, total dunces, and they’re politicians and they do stupid things and it turns out badly, send a copy to Bill Maher; he loves that type of thing. Look at your book, see who might be interested and don’t be afraid, no matter how powerful or famous the person is, to send it to them.